Rwanda Senate, members of parliament and families of politicians killed during the 1994 Genocide against the Tutsi gathered to pay tribute to politicians who were killed for standing with humanity in the face of evil. 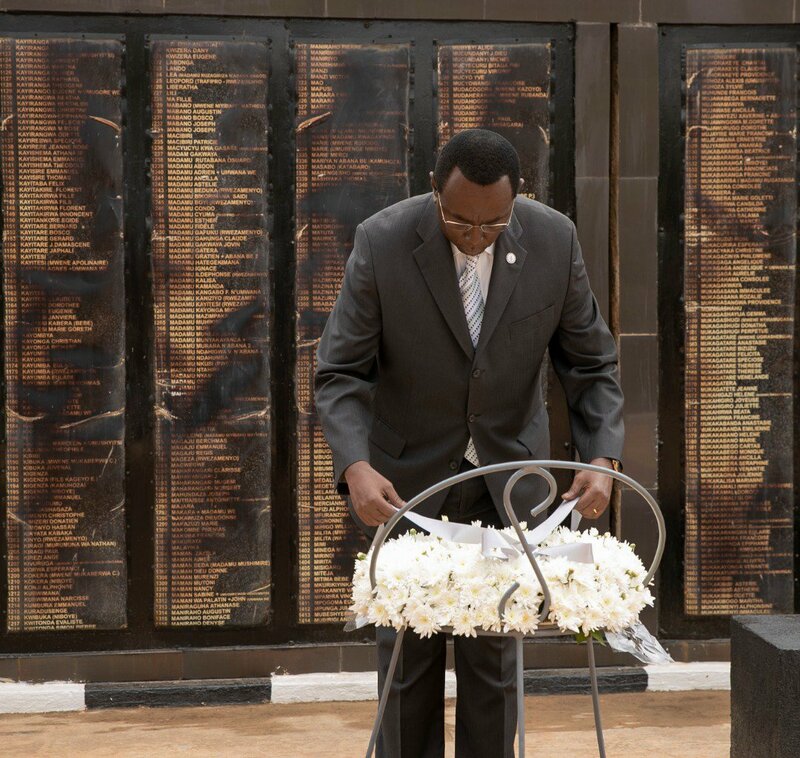 Senate President, Bernard Makuza, led the mourners to lay the wreath at Rebero Genocide memorial in Kicukiro district in the capital Kigali. 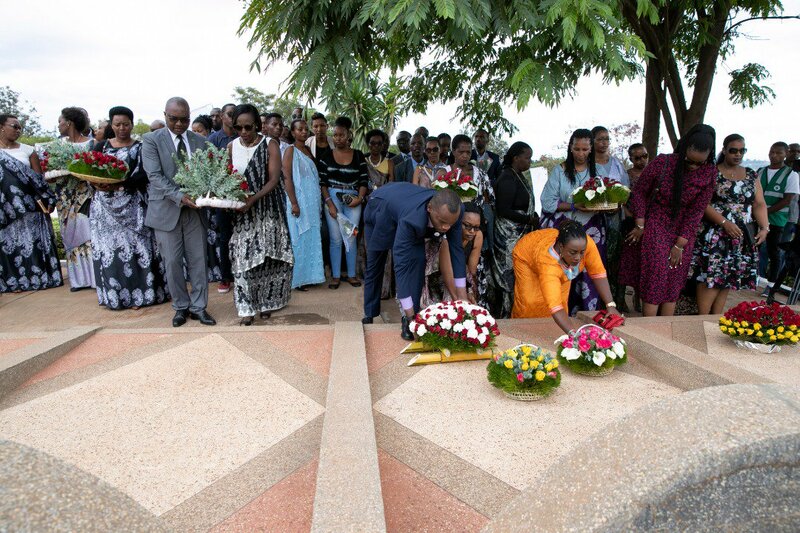 The memorial site is where politicians killed in the 1994 Genocide against the Tutsi are laid to rest. The event also marke the official closing of the 25th genocide commemoration week, which started April 7, 2019 across the country. Member of Parliament, Christine Mukabunani, representative of National Forum of Political Organisations said this is an opportunity for all Rwandan politicians to renew their commitment to rebuilding the nation and promote good governance. “The politicians we are remembering today paid the price of defiance. They tried to fight for the good governance of our country but this could not be possible because of the government that had a genocidal plan,” Mukabunani said. She said that politicians today are proud of the legacy of the commemorated politicians and will always keep their memories alive, but with a task of continuing their legacy of fighting for good governance. “As politicians today, we have chosen politics that promote the unity of Rwandans, fighting for the interests of all Rwandans without divisionism. That is our choice as Rwandans,” she said. Despite what happened in 1994, Rwanda has for the last 25 years quickly recovered from its horrific past in social, economic and political aspects of life – earning it a position among fatest growing economies and top among nations with good governance policies. Senate President Bernard Makuza highlighted that at the start of the journey after the Genocide, everything was a priority and government had to restore unity among Rwandans and rebuild people’s trust, starting with review of the constitution, unity and establishment of local justice Gacaca courts initiated to provide justice to victims. “Power sharing and participatory governance have been our key priorities and we chose consensual politics. Looking at the results of these approaches after 25 years, it is a duty of every Rwandan to protect these achievements,” Makuza said. Senate president also used the opportunity to send a political message to the International Community on their resolve to increase the fight against genocide denial and providing justice to survivors. “If the International Community really acknowledged its failure, it should adopt and implement these resolutions, which only a few countries have implemented them. We commend the countries that have demonstrated a political will by enacting laws against genocide denial. We encourage others to follow suit,” Makuza stated. The 12 politicians laid to rest at Rebero memorial site are part of more than 14,000 victims of the Genocide against the Tutsi. The politicians buried at the site were killed because they rejected discrimination and plan of exterminating the Tutsi and instead fought for the unity of Rwandans. They include: Landouard Ndasingwa, alias Lando, Venantie Kabageni, Charles Kayiranga, André Kameya, Aloys Niyoyita, Augustin Rwayitare, and Jean de la Croix Rutaremara, Joseph Kavaruganda, Frederic Nzamurambaho, Felicien Ngango, Jean Baptiste Mushimiyimana and Faustin Rucogoza. The politicians, many of who were members of either members of the Liberal Party (PL) or the Social Democratic Party (PSD), were reformists who called for peace and reconciliation, pushed for dialogue, and condemned the hate ideology that was being promoted by the then regime of former President Juvenal Habyarimana.